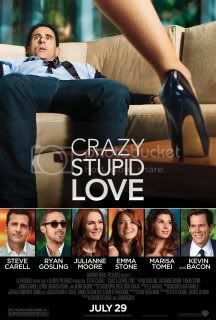 Crazy, Stupid, Love does very little to live up to its title. It’s a fairly sane and slightly stupid romantic comedy that functions as a generally agreeable piece of fluff. It’s distinction, however, is that it has a lot of working parts that should elevate its standing. Surprisingly, despite having so many fresh and interesting faces, the film suffers from a severe case of déjà vu. Crazy, Stupid, Love makes no effort to thread new territory in the romantic-comedy spectrum, instead subscribing to typical tropes of the genre, whereupon we substitute actors-of-then with actors-of-now. But instead of revitalizing the material, all the actors simply thread the same worn concept without much energy. There are two distinct problems that plague the film; One can easily be linked back to the film’s screenplay. Writer Dan Fogelman had primarily worked in the realm of animation, particularly with films (Cars, Bolt) that depend on a great deal of action to connect the narrative pieces together. What he misses is developing a sense of rhythm in Crazy, Stupid, Love. The film moves from scene to scene without a sense of narrative direction. We shift from one set of people to another without a connective arch to get us there. The arbitrary way in which the screenplay is constructed simply contributes to the languid pacing of the entire film. Secondly, directors Glenn Ficarra and John Requa unwisely play it safe with material that could have used a sharper edge. Perhaps in response to the onslaught of R-rated comedies that have come out in recent years, Crazy, Stupid, Love restrains itself. This becomes problematic when some of the film’s concepts almost necessitate a more coarse approach. This is particularly evident in the way they handle the babysitter/Steve Carell plot line, wherein the film threads on material that reminded me of Me and You and Everyone We Know, yet resolves itself without much thought. In what eventually becomes a staple of Crazy, Stupid, Love, virtually all the women characters see their narrative arches fade in favor of the central male characters’ issues. With their debut feature, I Love You Phillip Morris, the duo impressed me with their dark sense of humor and sharper directorial choices. In Crazy, Stupid, Love, the duo have a muted directorial presence. With sedated performances from talented actors like Steve Carell, Julianne Moore, and Ryan Gosling, the film becomes a bit of a slough. Surprisingly, I was probably most taken aback by Analeigh Tipton, whose small role offered a measure of nuance to a film we’ve all seen before.